The Old Bailey, officially called the Central Criminal Court – the figure of Justice on the top is not blindfolded, contrary to common belief. ... that in his first murder case, real estate and divorce specialist Frederick Geoffrey Lawrence saved suspected serial killer Dr John Bodkin Adams from being hanged? ... that the Lauterpacht Centre for International Law was named after its founder Sir Elihu Lauterpacht and his father Sir Hersch Lauterpacht? ... that in the six months after the Beerhouse Act was passed in England in 1830, nearly 25,000 new licenses to open pubs, taverns and alehouses were issued? ... that according to Conor Gearty, private and public nuisance in English law "have little in common except the accident of sharing the same name"? ... that after a meeting in 1940, the English Judges' Council did not meet for another 10 years? 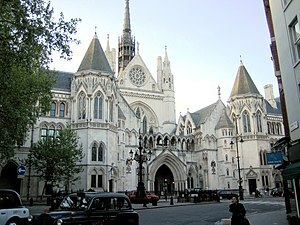 As England and Wales are part of the United Kingdom, many of the categories in Category:Law in the United Kingdom are also relevant.